Free performances will take place in the Gallery space. Full program running time is 60 minutes, short is 30 minutes. Tuesday, April 25, 7:00 pm. Members Event, RSVP Required. Saturday, May 13, 11:15 am. Richmond Regional Heritage Fair Opening. Thursday, May 25, 7:00 pm. Drink and Draw. Viewers must be at least 19 years old. Free entry includes drawing materials. RSVP required. Sunday, May 28, short performances from 1:00 – 4:00 pm. Family Sunday. Short performances for families at approximately 1:00 pm, 2:00 pm and 3:00 pm. Friday, June 2, 7:30 pm. Doors Open Richmond, Opening Event. Thursday, June 22, 7:00 pm. Film Screening of Seth’s Dominion followed by Performance. RSVP recommended due to limited spaces. 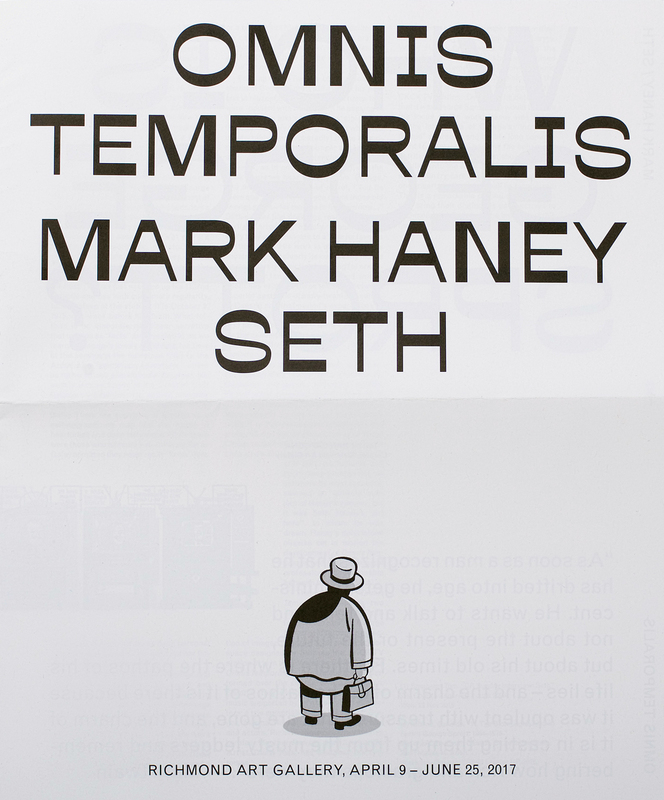 Omnis Temporalis is a multiform project that draws together the cartoon work of Canadian cartoonist, Seth, with contemporary classical music and performance by Vancouver-based composer, Mark Haney. Premiering at Richmond Art Gallery the new musical work, Omnis Temporalis, is based on Seth’s picture novella, George Sprott: 1894-1975, which explores themes of identity, time, change, loss and memory through various portrayals of the eponymous protagonist, George Sprott. In 2011 Haney approached Seth for permission to use the critically acclaimed George Sprott: 1894-1975 as the basis for the new work. Seth enthusiastically embraced the project and their ongoing dialogue resulted in this collaboration. Notably, Seth is designing an immersive cartoon space of the television station, CKCK, where George Sprott hosted his local television show, Northern Hi-Lights, for over 20 years in the fictional town of Dominion City. Over the course of the exhibition, free performances will take place in the CKCK TV station telling Sprott’s story through dialogue and music supported by an ensemble of characters, a trio of alto/bass flute, cello and double bass and Richard Newman as George Sprott. Costumes are designed by Diane Park. See Events for performance dates and other related programs scheduled during Omnis Temporalis. An exhibition brochure with essays by the Gallery’s curator, Nan Capogna, and Vancouver writer, composer, and musician, Rick Maddocks will accompany the exhibition. Mark Haney has been playing double bass for over two decades. By integrating his work with other arts in form and presentation, Haney has succeeded in drawing in new audiences, reaching new communities while expanding his artistic exploration by partnering with artists of excellence in music and other genres. His critically acclaimed CD Aim for the Roses was made into a feature film by filmmaker John Bolton. He has composed for live performance, recordings, film and art exhibitions, and has performed regularly with symphony orchestras (the VSO, Kamloops, Vancouver Island), new music ensembles (Redshift Music, Aventa), musical theatre (Bard on the Beach, the PuSH Festival) and popular music (The Beige, Anne Murray, Leahy, Rodney DeCroo). He is the Artistic Director of The Little Chamber Music Series That Could and Composer in Residence at Mountain View Cemetery. Seth is the cartoonist behind the comic book series PALOOKAVILLE, which started as a pamphlet comic book in 1991 and is now a semi-annual hardcover. His comics have appeared in New York Times Magazine, Best American Comics and McSweeneys Quarterly. His illustrations have appeared in numerous publications including the cover of the New Yorker, the Walrus, and Canadian Notes & Queries. He was Lemony Snicket’s partner for the Young Readers series, All the Wrong Questions, and has illustrated and designed a new, deluxe edition of Stephen Leacock’s Sunshine Sketches of a little Town. He is the designer for several classic comics reprint series, notably collections of work by Charles Schulz, John Stanley, and Doug Wright. He was the winner, in 2011, of the Harbourfront Festival Prize. The cartoonist has exhibited throughout the world in a variety of group and solo shows. He was the subject of a solo exhibition at the Art Gallery of Ontario, which showcased the first public display of his model city Dominion which is now part of the Gallery’s permanent collection. Dominion City subsequently toured Galleries from coast to coast including stops in Charlottetown, London, Lethbridge, Regina and Coquitlam. He is the subject of the award winning National Film Board documentary entitled “Seth’s Dominion”. Seth lives in Guelph, Ontario with his wife Tania, and their two cats in an old house named “Inkwell’s End”. Art awards. She is currently Interim Head of Wardrobe at the University of British Columbia’s Theatre and Film Department. The Richmond Art Gallery gratefully acknowledges the support of the British Columbia Arts Council and Canada Council for their support of this exhibition. 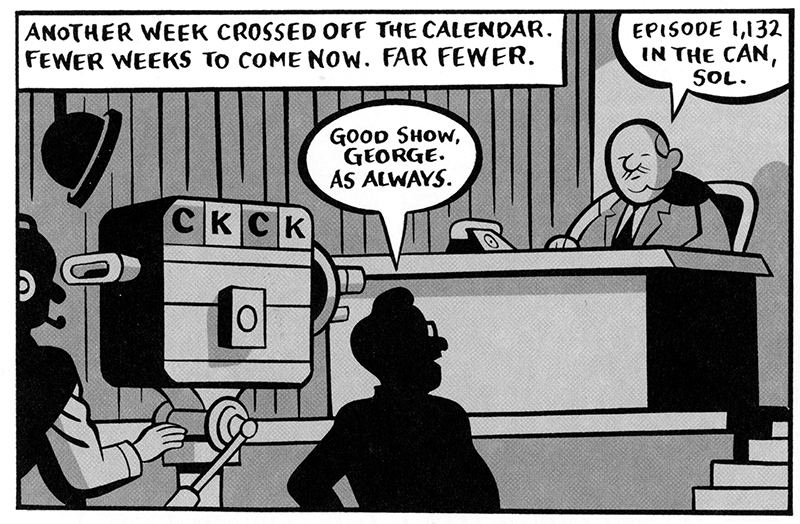 Above: Seth, from the graphic novel George Sprott: 1894-1975, 2009.